The Black widow has the worst reputation of any spider, but is not aggressive unless defending her cocoon. The male does not bite. This spider’s name probably resulted from the habit of female eating male after mating, but this is common to other spider species as well. The female is overall black, except for an hourglass-shaped red pattern (not always complete) on the underside of the abdomen, which is large and almost spherical. Legs are slender, front and hind pairs longer and more slender than middle pair. Male is about 1/3 the size of the female, with longer legs in proportion and red and white markings on the sides. The female makes a cocoon that may contain up to 300 eggs. Young hatch and feed on each other. After a few weeks, young emerge and start feeding on insects and other spiders. The Black widow has the worst reputation of any spider, but is not aggressive unless defending her cocoon. The male does not bite. Female venom is potentially fatal to humans, but this is very rare. The decision to seek emergency care should be made early. 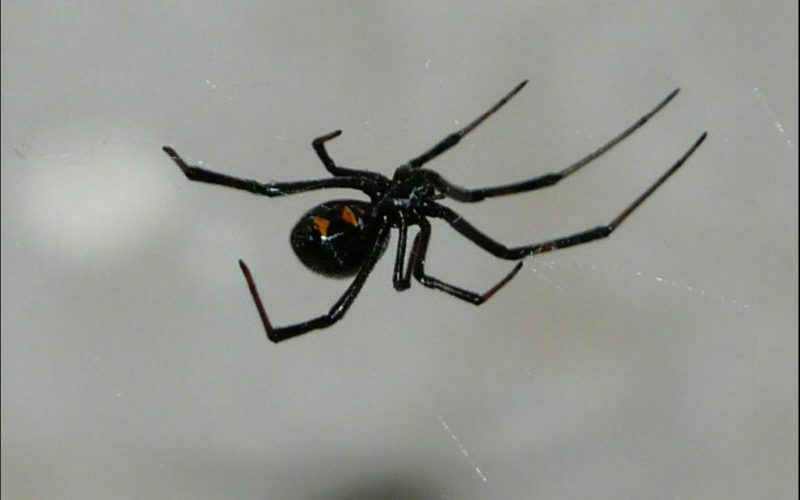 If the person, who was bitten by a black widow spider, has more than minor pain or has whole-body symptoms, seek care at a hospital’s Emergency Department. If symptoms are severe, call 911 for emergency medical transport so that evaluation and treatment can start en route to the hospital. Found from New Hampshire to Patagonia and west to the Pacific Coast, but more common in southern and western United States.